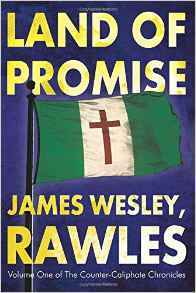 Most folks in the survivalist and prepper communities know who James Wesley, Rawles is - the first survivalist blogger and a prolific author, with six novels and two non-fiction books. His most recent novel, Land of Promise, is the first of The Counter-Caliphate Chronicles series. I just finished reading the book, and really liked it. It is definitely worth reading if you enjoy prepper and survivalist fiction, especially written from a Christian viewpoint. Land of Promise is a Christian survivalist geopolitical thriller. It is also technically science fiction since it takes place several decades in the future and features some not-yet-existing technology. But the futuristic aspects are realistic, not fantastic, so don't expect any space ships, lightsabers, or Star Trek-like transporters. The premise of the book is that an Islamic Caliphate, a successor to the current ISIS, has succeeded in being established throughout the Islamic world, and now dominates globally through its economic and military might, as well as the continued use of terror and fear. Aiding its world dominance is the political weakness, economic troubles, political correctness, and moral decline of the United States and the rest of the Western world. Westerners, in general, have lost much of their personal and economic freedoms to politically-correct police states that cower in fear of the Caliphate. Traditional, Bible-believing Christianity, in particular, has fallen out-of-favor in the West, with Christians being treated as second-class citizens, often persecuted for their beliefs. All this is very realistic considering current trends, if one is willing to take an honest look at what is happening today. In answer to this untenable situation, a small group of Christian business people and diplomats hatch plan to create a Christian homeland, the Ilemi Republic, in the harsh environment of a very sparsely populated area of eastern Africa. Africa seem a surprising choice, but the book provides a reasonable rationale for this location, which actually fits quite nicely the current real-world situation in east Africa. Land of Promise tells the story of the conception, founding, and early development of the Ilemi Republic. Not only is the nation created as a Christian homeland, but also one that prizes and protects personal and economic liberty, and self-reliance. In many ways, the book reads almost as a How-To manual for founding such a nation from scratch. This how-to aspect of the book brings up the one possible complaint many folks may have. Sections of the book seem almost like highly detailed shopping lists of the tools, equipment, and supplies needed to build infrastructure, and to create a national defense. In fact, some of it is shopping lists, as the book follows several Ilemi diplomats around the globe arranging to buy said arms and equipment and recruit needed skill-sets. These sections may be boring to those not much interested such things, but luckily for me I found it fascinating. These sections can be easily skimmed by those not interested without losing very much of the story-line. I did take notes as I was reading Land of Promise, and found many ideas and tips that I may be able to incorporate into my prepping and survival plans, even if I'm not creating a nation from scratch. This book is a serious warning of things to come, especially for Christians, if current world trends continue. I HIGHLY recommend it for Christian preppers and survivalists. As a geopolitical thriller, it is an enjoyable read. I give it 4.5 out of 5 stars. You can find Land of Promise of Amazon.